The national opioid epidemic escalated in 2016, driven by an unprecedented surge in deaths from fentanyl and other synthetic opiates, according to new data released Thursday by the Centers for Disease Control and Prevention. More than 42,000 Americans died of opioid overdoses in 2016, a 28 percent increase over 2015. The number of people fatally overdosing on fentanyl and other synthetic opiates more than doubled, from 9,580 in 2015 to 19,413 in 2016. Deaths due to heroin were up nearly 20 percent, and deaths from other opiate painkillers, such as hydrocodone and oxycodone, were up 14 percent. 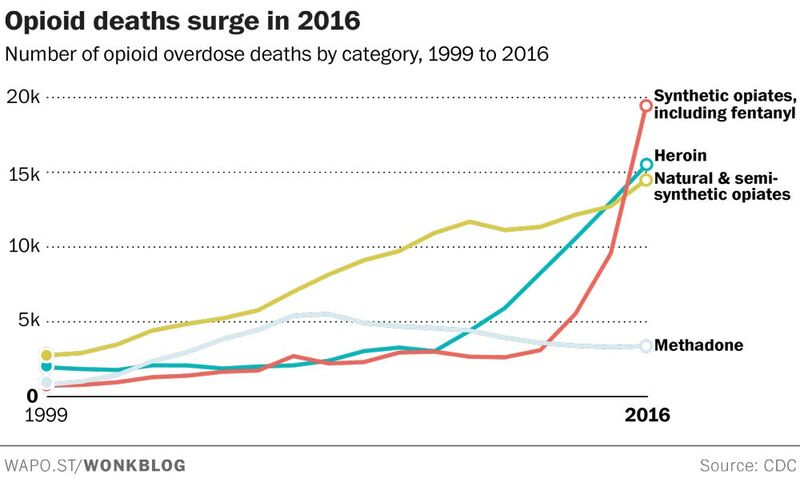 Overdose deaths from all drugs, including non-opioids, stood at 63,600 last year, an increase of 21 percent over the 2015 number. On deaths from synthetic opioids, primarily fentanyl, “we’re talking about more than an exponential increase,” Anderson added. And while only limited provisional data is currently available for 2017, things don’t look any better. “My guess is that when all of the data are in that the  trend line will be at least as steep as for 2016, if not steeper,” Anderson said. While drug mortality has been increasing among all age groups since 1999, it’s currently highest among those age 25 to 54. Overdose rates for all drugs were roughly 35 cases per 100,000 individuals among all three groups in 2016, compared to 12 deaths per 100,000 for those under 24 and 6 deaths per 100,000 among seniors age 65 and up. Men (26 deaths per 100,000) are about twice as likely to die of a drug overdose as women (13 per 100,000). At the state level, West Virginia stands alone as the epicenter of overdose mortality in the U.S., with 52 deaths per 100,000 residents in 2016. The two next-highest states, New Hampshire and Ohio, saw 39 deaths per 100,000. “The Trump administration has failed the country completely in its response to the opioid epidemic,” Humphreys added. Earlier this year, President Trump’s opioid commission recommended that the crisis be declared a national emergency, a designation that could have made emergency funding available. But in October, the president instead declared a public health emergency around the crisis, an announcement that carried no promise of additional funding. The political dithering is costing American lives, Kennedy said – 174 deaths from drug overdoses every day in 2016, one every 8 1/2 minutes.